Moving to the Poconos isn’t like moving from the city to the suburbs. It’s more serene and peaceful. Frankly, it’s more rustic. That doesn’t mean it’s uncivilized—it’s just that there are more open spaces that include wetlands, parks, and natural areas where it’s not possible to build. What you will find are smaller towns with town enters and lots of unspoiled nature. It's not the suburbs—but that's kind of the point. The Poconos region has a well-earned reputation as a great destination for winter skiing. In fact, some people think of the Poconos exclusively as a winter wonderland. Others only consider it as a place to escape the summer heat in the cool of the trees along gently flowing waters. The fact of the matter is that it’s really a place for all season, with plenty of activities all year long. Whether you enjoy hiking, boating, swimming, golf, bird watching, leaf peeping, skiing, or snowboarding, you’ll find it here. The weather here is seldom boring. It’s not unusual to see locals wearing shorts and mittens at the same time. It may be snowing to beat the band up on Mount Pocono at the same time that people at lower elevations are lounging at outdoor restaurants. Don’t worry—you’ll adapt! A lot of the local names are derivatives of Munsee Native American words. You may run into a few town names that you have difficulty pronouncing (or even reading at first!). If you’re talking to someone and Sciota (“Sy-o-ta”) or Analomink (“Ann-ah-low-mink”) rolls off their tongue with ease—you’re probably talking to a local. The good news is that if you move here, you'll be able to impress visitors (and friends will want to visit) with your newly acquired linguistic skills! Sometimes people coming from high population density areas are concerned that they won’t have access to things they want or need. Don’t worry. At The Crossings Premium Outlets, you'll find major store brands (American Eagle and Banana Republic) at a deeply discounted prices. But once you've been here a while, you'll know to leave those stores to the tourists on the weekends and do your shopping on weekdays. And you’ll also find plenty of intriguing shops that offer unusual items in many of the region’s small towns. In the Poconos, you won't simply choose between one or two paltry "parks" (with some grass, a few trees, and a handful of benches). The region hosts seven state parks, six designated natural areas, and 17 state-designated game areas, in addition to the Delaware Water Gap National Park. Plus, “Take a hike!” will take on a whole new meaning for you! This may not come as a big surprise to you. 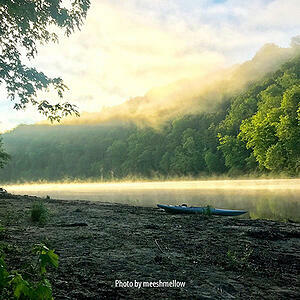 There’s a good chance that the stunning scenery is at least part of the reason you’re considering a move to the Poconos. There’s also a chance that you’re not aware of the breadth of beauty here in the region. I invite you to take a look at 12 photos that will blow you away and make you fall in love with the Poconos! Of course, having the perfect home in the Poconos makes all this “adjusting” a whole lot easier! Check out these photos of how great a custom home in the Poconos can be!